I approach the Astor Place subway stop, headed uptown. It is late, near midnight, but the station is as crowded as always. I descend down multiple flights of stairs, treading slowly as the stairs are cracked and flooded by recent rains. I clutch the rickety banister, praying it doesn’t give way. Waiting on the crumbling platform beneath rusty signs and broken tiles, I get a whiff of Eau d’Subway: a subtle blend of mildew, trash and urine. I wonder if people actually pee on the subway platform, or if the smell has wafted through the vents on sidewalks above. I have seen a dog or two relieving itself directly into these vents. Breathe through mouth, I think to myself. Think happy thoughts. I want to look away, but like a train wreck (no pun intended) I can’t pull my eyes from the family of fuzzy rats skittering expertly across train tracks flooded in a sea of rain water, dejected soda cans and candy wrappers. They look perfectly at home. 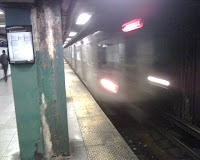 An express train shrieks by, sending a gust of wind through the tunnel. Hair blows in my face as I plug my ears, trying to block out the piercing sound of metal scraping against metal. The mildly-drunk couple next to me eagerly explore the inside of each others' mouths, blissfully oblivious to their surroundings. Finally, a 6 train pulls into the station. As I step inside, an empty bottle comes flying through the car doors, whizzing right past my head and landing on the platform. The thrower of this bottle sits casually inside the train, laughing; he seems to find this hilarious. I am annoyed, but one good look at him and I decide to keep my mouth shut. He is enormous – at least four times my size. A black Raiders cap sits backward on his oversized head, his jeans hang loose around his gigantic knees. He is a kid, a punk, probably no more than 18 years old. If I were my mom, I would say something witty and cutting to make him feel bad about what he did. But I am not my mom. And I really don’t need to get body slammed tonight. I glance away, taking in instead the scene around me, the trash that blankets the sticky floor of the subway car, the streaks of dirt on the car doors. Most everyone who is standing holds tight to the metal bars that run overhead. I watch one guy diligently explore the inside of his left nostril, then reach back up to grasp the bar with the same finger that was just inside his nose. The woman next to me is devouring a slice of pizza, grease dripping down her chubby chin and onto the floor of the car. At the far end of the train, a man without a home is stretched out on a bench, sound asleep with his dilapidated old wheelchair sitting at his side. I can smell his urine-stained clothing from the opposite end of the car. It makes me sad. The brakes squeal for mercy as the train pulls into the next station. A glittery 20-something in stretch pants stands at the door, ready to step out. As she waits to exit, the giant in the Raiders cap utters some sleazy, sexual comments to her, then cracks up at himself as she walks away in disgust. The doors close and the train lurches forward once again. Still laughing, he pulls out a miniature Bible and gets lost in its words.